Before Baki was born, I had lots of lofty ideals about feeding him. I remember when Jessica Seinfeld’s cookbook, Deceptively Delicious came out, I sniffed and thought, “My kid is going to look vegetables in the face and love them.” It used to be true. 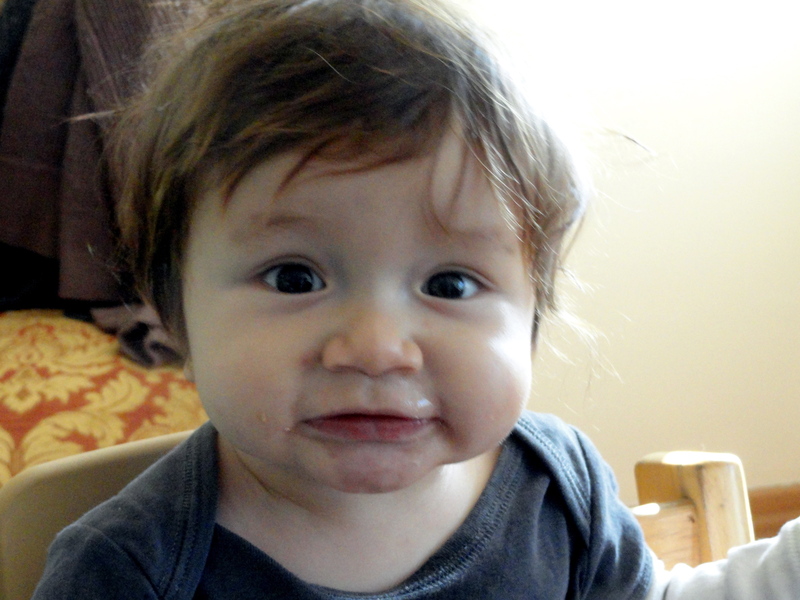 I looked back at an old blog I wrote about Baki’s first year or so, and he was eating all sorts of things – pumpkin, brown rice, avocado – some of the staples of Kaya’s diet today. Somehow, though, he has evolved into a kid who will reject certain things on sight, including most cooked vegetables (although to be fair, he does like a fair number of raw ones). I own that cookbook now, and regularly sneak chickpeas into Baki via chocolate chip cookies, or pumpkin via chocolate cupcakes. I was very happy, then, when I found an interesting recipe for chocolate cake with beets. It is good! Baki lunged for them when he got home, and wasn’t even suspicious when I stood by smiling while he wolfed down a cupcake before dinner. Oh how I have fallen from those lofty, early days. Luckily, Kaya loves his vegetables, and happily eats lentils, never turning his nose up when I add flax seed oil or wheat germ to his food. I haven’t ruined this one yet, in other words. Eating and drinking are discoveries for him, and his latest finding occurred while having a drink of water. 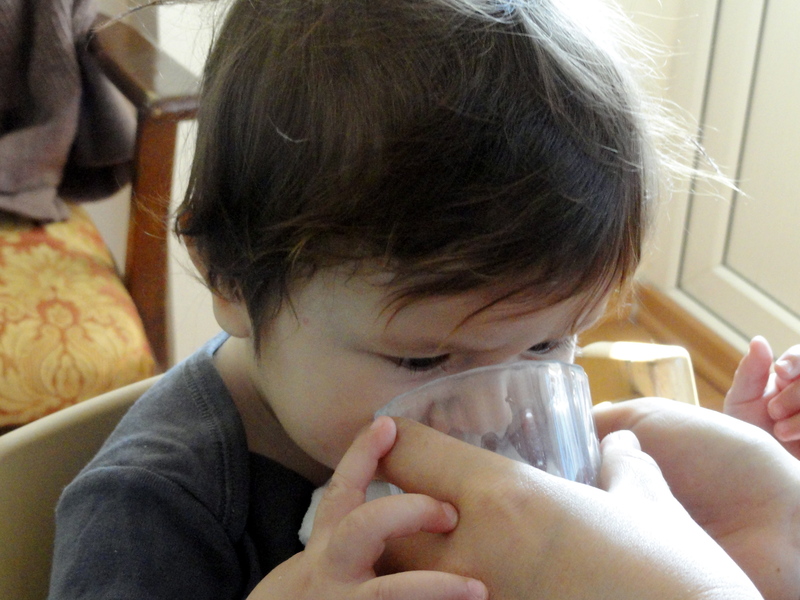 I usually let him drink from a glass at the table since he is not really that into sippy cups. He is getting the hang of sipping, but what is sipping compared to blowing bubbles? He will do it for as long as I let him, and is furious when I take the glass away. It’s a bit messy– there is a puddle of water by the end of it. But it gives him tremendous satisfaction. Wherever a process of life communicates an eagerness to him who lives it, there the life becomes genuinely significant. It’s from an essay by William James, “On a Certain Blindness in Human Beings.” For Christmas, my mother gave Ali and me two slim volumes from Penguin’s Great Ideas series: this book and a George Orwell book called Some Thoughts on the Common Toad. That is also a wonderful read and I appreciated for the first time what a good writer George Orwell was (1984 was a long time ago). I do not think, after reading his descriptions of toads, that I will ever look at our resident toads in quite the same way. I was never dismissive towards them, and the discovery of tiny baby toads is a particular delight, but they seemed the noblest of creatures when so eloquently described. Reading these two books, I marveled at how some people have ideas so good they’re worth committing to paper and binding together. I’m so excited about your links, I’m not sure what to try first. Thank you! I’ve followed you back from your visit at my blog. I will definitely be back for more but, I just had to say, your little Kaya is adorable! Of course you let him blow bubbles. How could you ever say “No!” to that cherub? I sure couldn’t. Lucky for me, we’re still in the grace period where it’s my sole purpose to indulge him! Welcome, and please do stop by again.